With the weather turning colder here in NY (we’ve already had snow! ), we’re spending a lot more time indoors. I like the cozy feeling of staying in, but after a while cabin fever sets in and my two boys become restless. I like to try to keep us all entertained in the house, and we play a lot of board games together as a family to pass the time. We’re expecting another harsh winter this year in NY and I’m glad to add some new games to our collection from Wonder Forge to entertain us and bring us together as a family. * Disney Junior Super Stretchy – this game is a hoot. 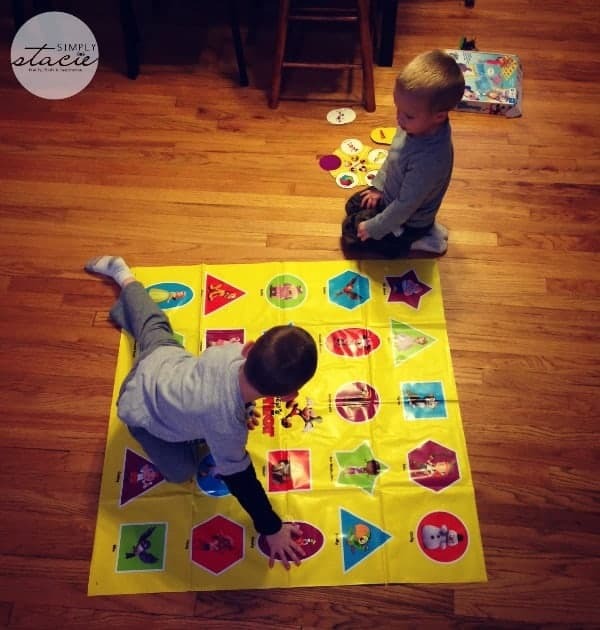 Think of a kid version of Twister – one player calls out the moves, while the other figures out how to move and twist and compete the tasks. 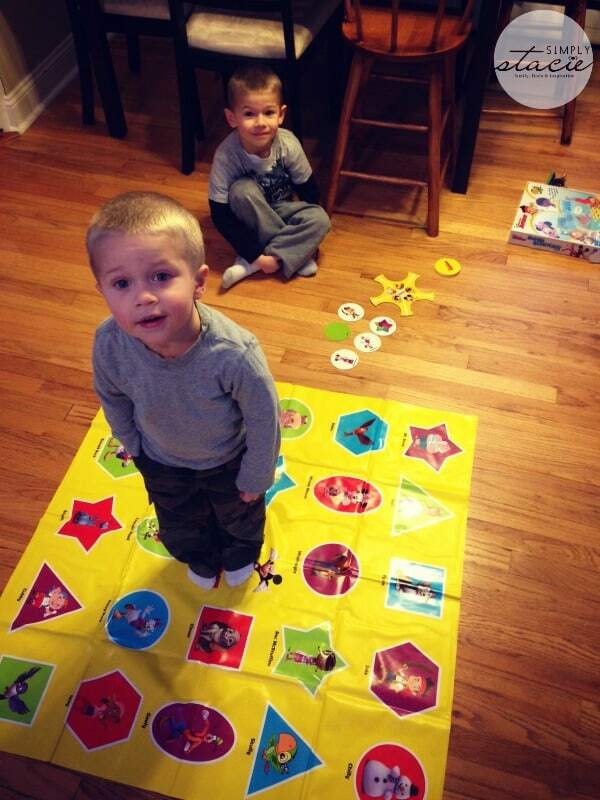 My two boys have such a blast with this game and they giggle and crack themselves up with their crazy moves. This game is recommended for ages 3 and up. This game has an MSRP of $17.99. * Disney Pictopia – this trivia game is recommended for ages 7 and up. This is one of those games that we play with my older guy after little brother goes to bed. This would make a neat game for an adult game night too, with questions ranging from classic Disney films to newer Disney Junior shows. You can see a video of this game in action on the Wonder Forge site. This game sells for $19.99. * Ultimate Spider-Man Trickshot Duel – this game is a neat action game where players shoots discs to try to take out their opponents hero/villain pucks. The last man standing wins! This game is recommended for ages 4 and up with an MSRP of $19.99. My boys are big Spider-Man fans and this has been a huge hit with them. Since its launch, Wonder Forge has consistently offered top-quality preschool and family games that bridge generation gaps and encourage creativity. Today Wonder Forge makes over 85 games that have won more than 160 industry awards for product excellence. To find the perfect game for you and your family, check out the Wonder Forge website. You can also find them on Facebook and Twitter. Disney Eye Found It would be a game my kids would like! I like the The Grinch Christmas Bingo. Another product I’d like would be the Star Wats Face Off dice game. I like the Grinch Christmas Bingo!